ShukerNature: KING HARES AND GIANT RABBITS - KEEPING CRYPTOZOOLOGY ON THE HOP! KING HARES AND GIANT RABBITS - KEEPING CRYPTOZOOLOGY ON THE HOP! Hares are among the most delightful and enigmatic of British mammals, and down through the ages they have been many things to many people – symbols of fertility, the moon, and Easter, to name but a few. They have also been described in many ways – magical, mystical, and even mad, but never monstrous, surely? However, a number of eyewitness accounts have been filed from various parts of the British Isles that describe mysterious, unidentified animals resembling hares, or even rabbits, but of truly monstrous, massive proportions. What could such extra-large lagomorphs be? 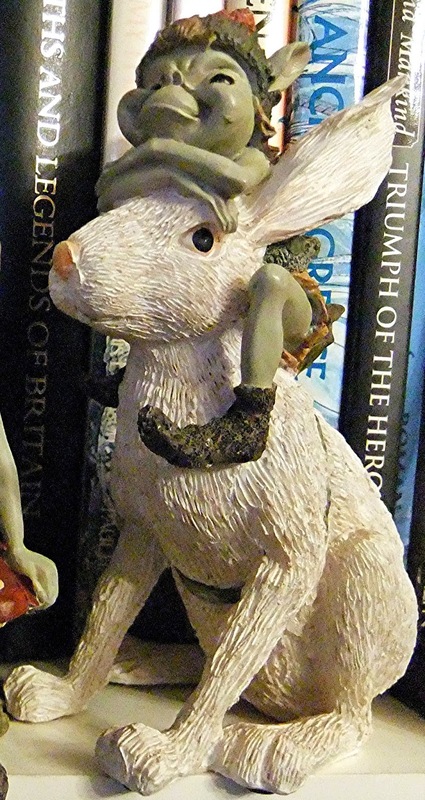 Here is a selection of reported encounters with these so-called king hares and giant rabbits. It was to the following mystery beast that the term 'king hare' was first applied. During a lengthy two-month-long hike from the Cotswolds, through the Wiltshire Downs and west Dorset's coastal regions, before ending in Butleigh near Glastonbury in Somerset, by early September 1976 Louise Hodgson had reached the Dorset hamlet of Uploders. She and two gypsy men whom she'd met a little earlier were walking their dogs together along a lonely track there one evening, in search of some hares or rabbits to catch and eat, when they came to a valley, in which they spied a group of about ten hares together – an unusual sight in itself, as these animals are normally solitary at that time of year. But even more unusual was the presence of what they initially took to be a roe deer among the hares – until they peered closer and realised to their amazement that it too was a hare, but one of enormous dimensions. They stayed for a while, gazing in wonder at this prodigious creature and keeping hold of their dogs to ensure that they did not chase after it, before finally walking away, leaving behind the king-sized hare and its normal brethren. Banbury in Oxfordshire was the epicentre of a couple of notable sightings in more recent times. The first of these took place one early evening during summer 2005. Driving home to Wendlebury, just 20 miles south of Banbury, Clive Parker observed squatting at the roadside what he considered to be a gigantic rabbit. He estimated it to be as big as a large dog, light brown in colour, with a somewhat pointed face, and sitting on its haunches watching him as he drove past. It took a few seconds for this bizarre sight to register in his shocked mind, but once it did he stopped and swiftly reversed to the spot where he'd seen this creature. 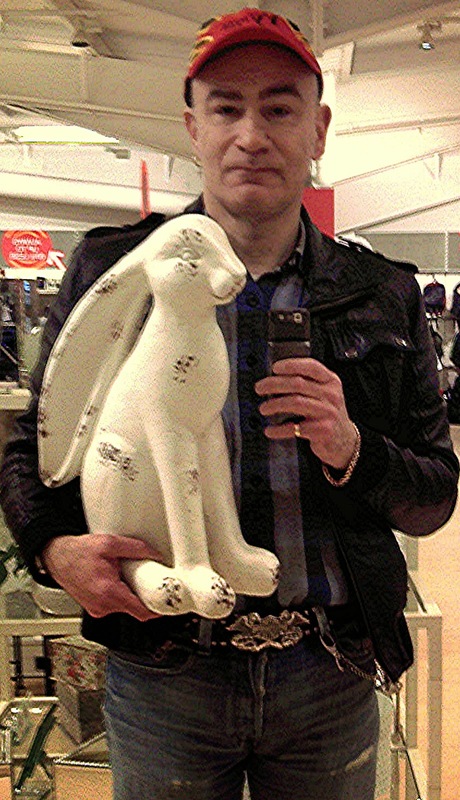 Inevitably, however, the mega-bunny was gone. Clive Parker was alone when he made his observation, but the second sighting, which occurred on 24 October 2006, featured multiple eyewitnesses. These were Tim Hill, his family, and some friends, who were all taking part in a canal boat journey, travelling north along the Napton-Banbury route. On the highest stretch of the canal, they looked to their right across a sloping field, and spied what they assumed at first to be a deer. Roughly the size of a golden retriever dog, it sported reddish-gold fur, but seemed to have rather big ears for a deer. When Tim's wife Mandy and one of their friends, David, both looked at it through binoculars, however, they were astonished to discover that it was what they later described as a giant rabbit. While everyone was watching it, this remarkable animal bounded away into a hedge close by, and was not seen by them again. They felt that it was too chubby and rounded to have been a hare, and was not like a wallaby or kangaroo either – it was simply like a normal domestic rabbit, but one of decidedly abnormal stature. Just a few months before the Banbury encounter by Tim Hill and company, a similar mystery creature had been hitting the news headlines much further north, in and around the village of Felton in Northumberland. The first media reports emerged during early April 2006, when twelve disgruntled local gardeners who maintained allotments on public ground in Felton complained that their prized vegetables were being regularly trampled upon and munched during night-time raids carried out by a dog-sized rabbit, black and brown in colour, and which left behind giant-sized footprints bigger even than a deer's. The first sighting had been made in February by one of the gardeners, Jeff Smith, and three other villagers also caught sight of it later. 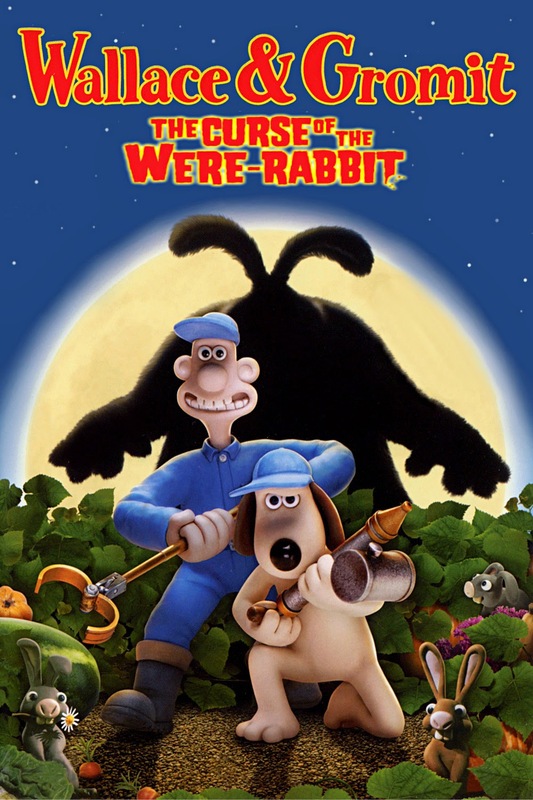 With such reports receiving publicity not only so soon after April Fool's Day but also not long after the cinema release of the Wallace and Gromit film The Curse of the Were-Rabbit, a degree of scepticism was undoubtedly justified, but the allotment gardeners' protestations continued unabatedly, and the evidence of their squashed (and scoffed) produce was there for all to see. In addition, they announced that they were hiring two gunmen to mount guard upon their allotments, and who would shoot the giant rabbit on sight. Thanks to global online interest in this elusive animal, however, which by now had been variously – and amusingly - dubbed Bigs Bunny and the Wor-Rabbit in media accounts, the gardeners' statement swiftly attracted condemnation from readers worldwide. Some even offered to pay for the rabbit's unharmed capture and transportation to them. Such requests proved unnecessary, however, when on 11 May, Rael Rawlinson, a local 18-year-old student, revealed that a month earlier, while she was driving along a road near to Felton with friends late one night, what she referred to as a "massive, abnormally big" rabbit had abruptly bounded across the road directly in front of them and had been fatally run over by her car. Such was the impact of the collision that her car's bumper had been cracked and was virtually hanging off, and when examined a tuft of rabbit fur was found attached to it. Getting out of her car, Rael had scrutinised the creature's body, which she claimed was at least 2 ft long and was very tall too, but she did not think to salvage it. When she told others what had happened, they visited the spot to find the body, but it had gone, no doubt taken by a fox or stray dog. And as no further nocturnal escapades in the allotments have been reported, it does indeed seem that the Felton mega-rabbit is no more. Giant lagomorphs are apparently not confined to the island of Great Britain – comparable creatures have also been reported from Ireland. During the late 1970s, while fishing one day with his father in a rowing boat at Lough Ree on the River Shannon, Morgan C. Jones of Dublin caught sight of what, when viewed through binoculars, seemed to resemble a huge rabbit, on an island in the middle of the lough. 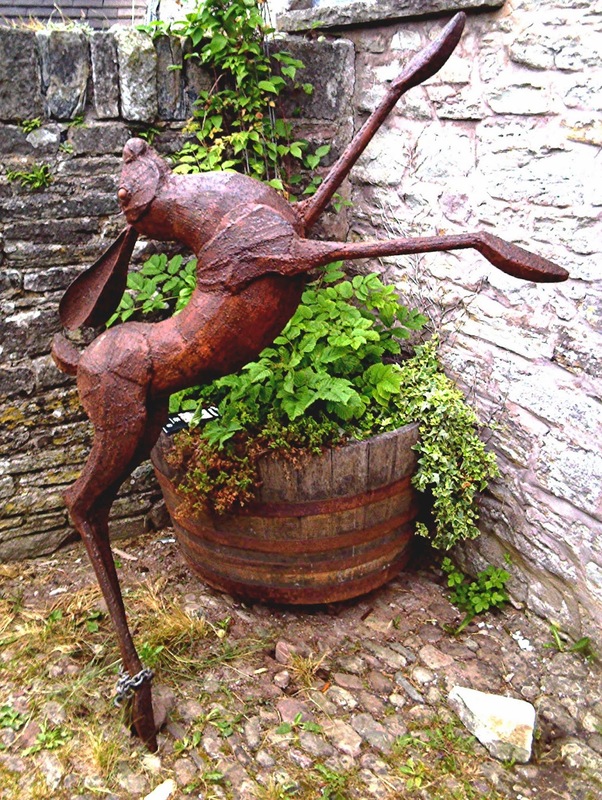 Almost a decade later, during the mid-1980s, aged in his 30s, Andrew Munro of County Cork was in his mother's garden when, while walking through a gateway, he almost collided with an enormous hare. Standing on its hind legs with ears erect, it was over 4 ft tall as far as Andrew could estimate, and he and the hare stood looking at each other for what seemed like ages, even if in reality it was no more than a couple of minutes. This spell was abruptly broken, however, when Andrew's dog spotted the hare and immediately charged towards it. 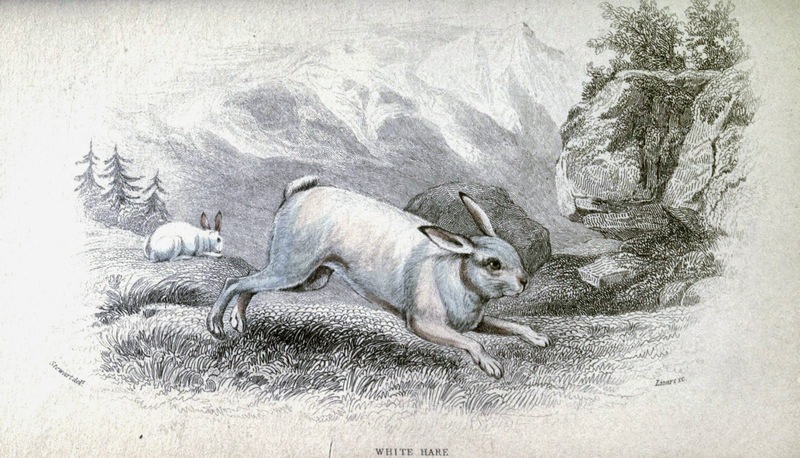 But with just a few huge leaps, the king hare readily evaded its canine aggressor, showing no fear – indeed, it actually seemed contemptuous of the dog – as it bounded swiftly out of the garden, across the drive, through the fence, and across a nearby field, leaving Andrew's frustrated dog far behind. So what could these most curious of creatures be? 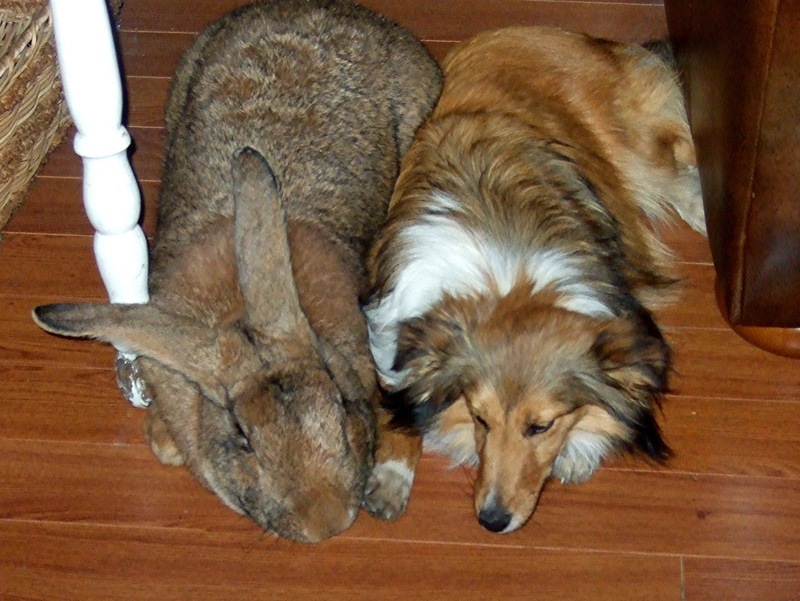 As far as the giant rabbits are concerned, the most likely, reasonable explanation is that they are merely escaped or even deliberately released specimens belonging to one or more of the several breeds of giant domestic rabbit that have been developed in modern times, originally for their meat but which have become increasingly popular nowadays as pets too. 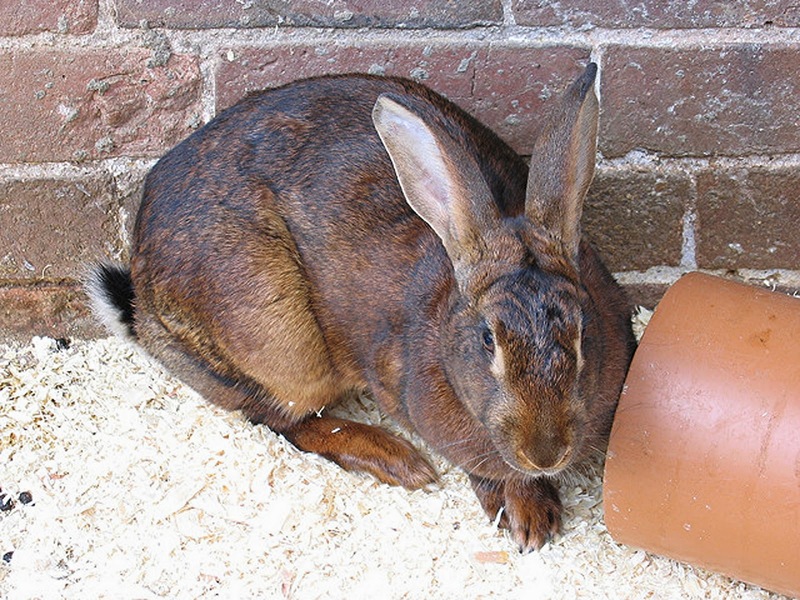 Notable among these breeds is the Flemish Giant, originally bred as early as the 16th Century near Ghent in Belgium. Nowadays a frequently-exhibited show breed around the world and occurring in a wide range of colours, it can weigh as much as 30 lb without being obese, and in overall size is comparable to a cocker spaniel. Another extremely large breed is the Continental Giant, descended from the Flemish Giant. The world's largest rabbit currently alive is a Continental Giant named Ralph, who tips the scale at a truly staggering, non-obese weight of 55 lb! 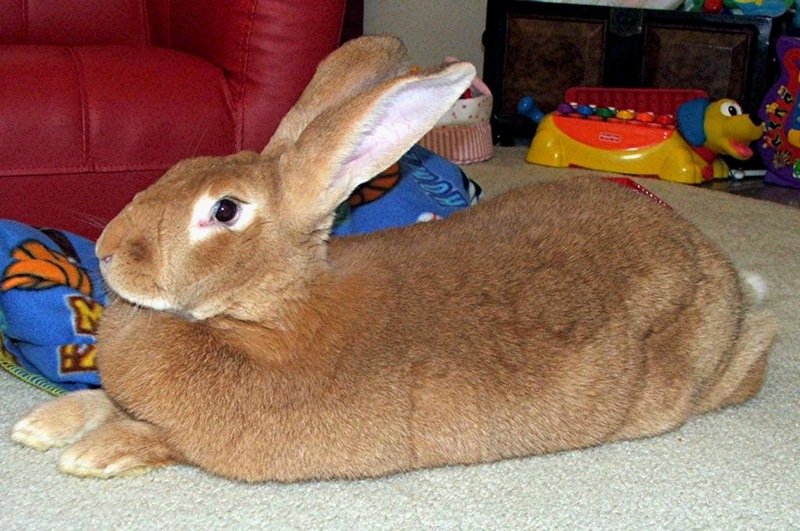 Click here to view a YouTube video of Ralph, the world's largest rabbit. There is little doubt that an absconded Flemish Giant or Continental Giant could plausibly explain the Banbury mega-rabbit, and rabbit experts consulted by the irate allotment owners in Felton also consider this a likely explanation for the demised wor-rabbit. Sadly, however, it is unlikely that they would survive long in the wild. Their huge size would readily attract unwelcome, potentially lethal attention from birds of prey, foxes, and stray dogs; and they would have no knowledge of how to avoid motor vehicles, as the Felton wor-rabbit fatally demonstrated. But what of the king hares? The British Isles is home to two indigenous species of hare. 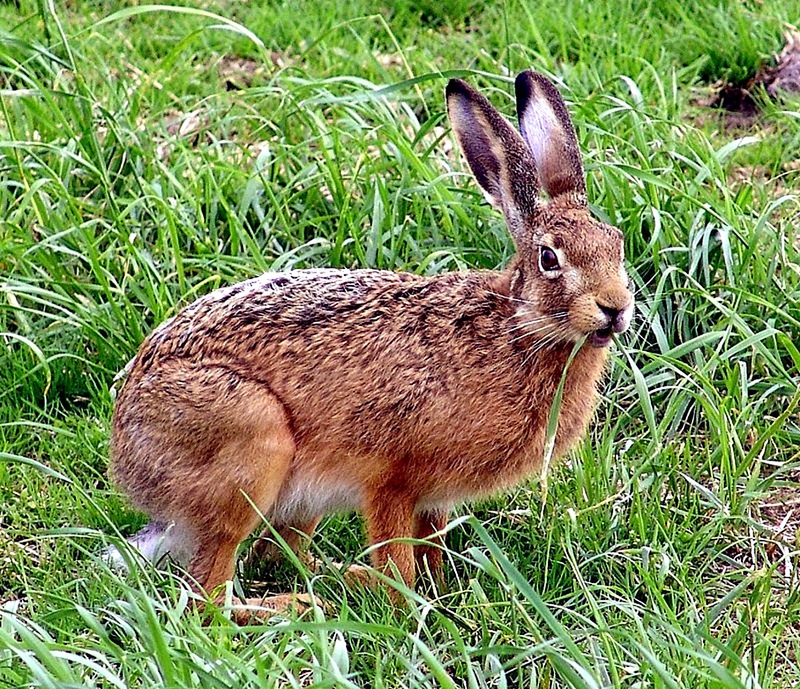 The most common, widespread, and familiar of these is the brown hare Lepus europaeus, which is absent from Ireland as a native species (though it has been introduced into Northern Ireland) but is distributed throughout Great Britain and various offshore islands. One of the world's largest species of hare, it can attain a body length of up to 30 in, plus a tail length of up to 6 in, which means that individuals at the upper end of this species' size range can be as much as 3 ft, and can weigh up to 11 lb, i.e. as big as a decent-sized dog. As many people do not realise that hares in Britain can attain such notable dimensions, the sight of an exceptionally large hare coupled perhaps in some cases with less than accurate size-estimation skills on the part of its observer(s) may be sufficient to 'create' a king hare. Moreover, there might be individual hares possessing a mutant gene that expresses extra-large body size, or even suffering from a hormonal imbalance that results in gigantism, comparable to various endocrinologically-based conditions recorded from humans. The second species of British hare is the mountain hare Lepus timidus, which, as its name suggests, is particularly adapted for a montane existence, and famously turns white in winter. It has been introduced into Scotland's Lowlands, many of its islands, and to the English Pennines, but is indigenous to the Scottish Highlands, and also to Ireland - represented here by a very distinctive subspecies, the Irish hare L. t. hibernicus, found nowhere else. This is another large hare, only slightly smaller than the brown hare, and all that has been suggested above as explanations for king hare sightings in Great Britain applies equally to such sightings in Ireland too – plus one intriguing additional possibility. After Morgan C. Jones had observed a giant rabbit on the island in the River Shannon where he and his father were fishing, his father told him that during the 1940s, a very large domestic breed of lagomorph known as the Belgian hare, much bigger in size than the Irish hare, was introduced into the Irish Republic as a potential food source. 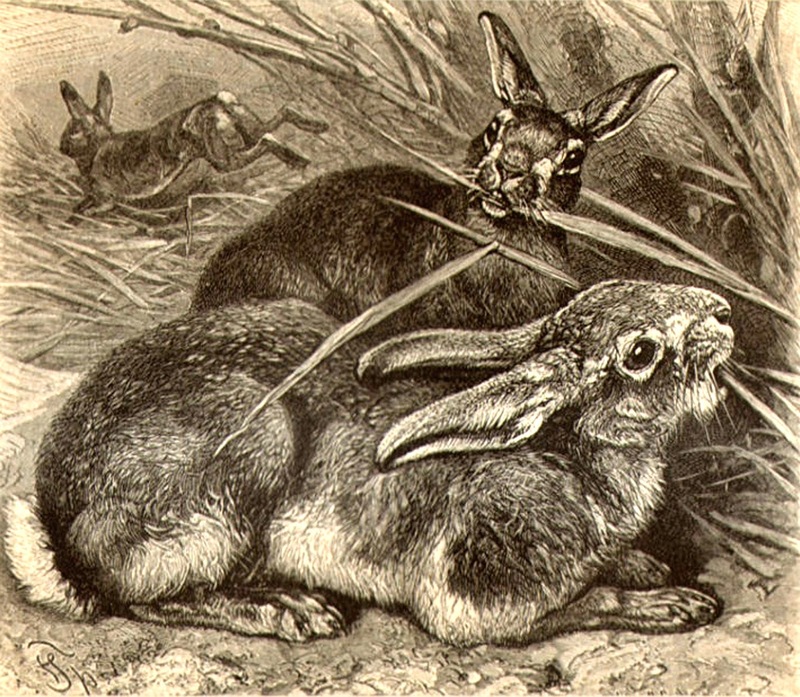 Unfortunately, it bred so prolifically, posing a major risk to the ecosystem, that it was subsequently eradicated, with the last specimens having been corralled on the very island where Morgan had seen his giant rabbit – thus suggesting that what he had spied was an elusive, still-surviving Belgian hare. Making this even more interesting is the fact that despite its name, the Belgian hare is not a hare at all, but a breed of rabbit, albeit one bred specifically to look superficially hare-like, hence its name. 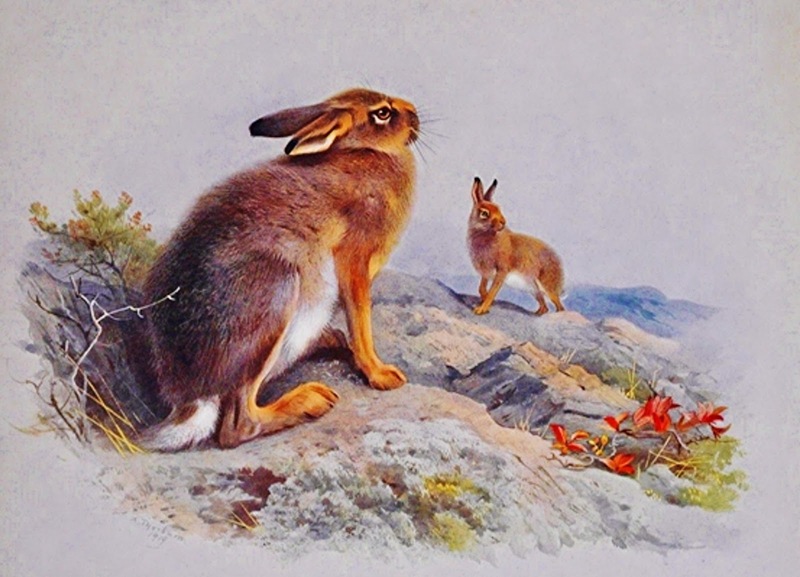 There is also the prospect that some supposed king hares and giant rabbits, especially if only glimpsed briefly, were not bona fide lagomorphs at all, but were instead escapee or naturalised wallabies (there are naturalised populations living in several regions of Great Britain), or even those introduced but successfully-thriving small Asian deer known as muntjacs. 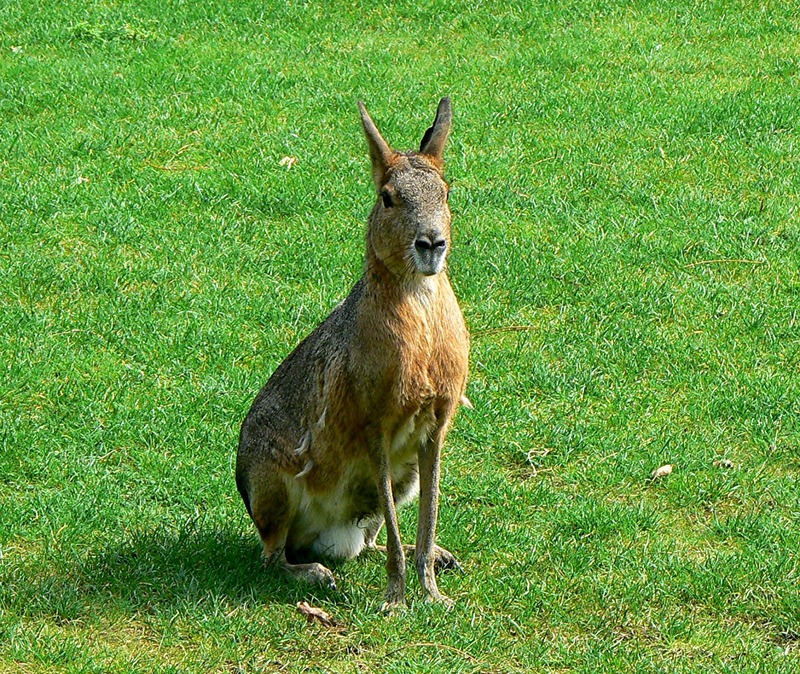 One further non-native species well worth considering in relation to this prospect is a very curious South American rodent known as the mara or Patagonian cavy Dolichotis patagonum. It is very commonly exhibited in zoos and wildlife parks, but despite being related to guinea pigs it is extremely hare-like in overall appearance, due to its long limbs and ears plus its general body form and stance. Moreover, as one of the world's largest rodents, it could easily be mistaken for a giant hare by observers not familiar with its species, so an escapee mara existing in a given area could certainly explain reported sightings there of supposed king hares or long-legged giant rabbits. Remembering the hare's many traditional links to pagan lore, the occult, and even Faerie, it is only fitting that the final account of a giant mystery hare documented here is one that seemingly transcends normal cryptozoological boundaries and ventures into the preternatural. While walking alone one bright summer morning through Windsor Great Park, Sibell Lilian Blunt-Mackenzie, 3rd Countess of Cromartie (1878-1962), saw a bizarre-looking animal slowly approaching her. It resembled a hare, and moved with a typically leporine, loping gait too, but it was huge, as big as a goat! Making it even more caprine in appearance, however, was the pair of curved horns that it bore upon its head. The countess was so astonished by this uncanny beast that she stood motionless, until, as it passed by her, she struck out at it with her parasol – and it immediately vanished! A strange tale indeed, but when dealing with creatures as magical and evanescent as hares, nothing should really surprise us. Or, to put it another way: hare today, gone tomorrow! Source acknowledgement: Some of the above reports originally appeared in the readers' letters pages of the British monthly periodical Fortean Times. STOP PRESS - A LOST KING HARE PHOTOGRAPH? Shortly after posting this ShukerNature blog article online, I received a couple of very interesting tweets (Twitter messages) from Mary Epworth. Mary lives on the East Hertfordshire/West Essex border, and she mentioned in her first tweet that she has been told about king hare stories from that area. Moreover, in her second tweet she stated: "There is supposedly a photo of one in a pub, but nobody knows which". Is there anyone from Mary's part of the world reading this article of mine who does know which pub has this potentially significant crypto-photo? If so, I'd very much like to hear from you! Aaaaah! You used the "hare today, gone tomorrow" pun! Right at the end, too, after I thought we'd been spared it. ;) Nevertheless, an excellent article. Do I remember rightly that hares have a reputation for being able to vanish even in short grass? I've only seen one hare in my life, and to someone unfamiliar with them, they can appear larger than expected. Yes indeed, hares are incredibly good at vanishing, little wonder why they have a magical, otherworldly reputation. I've been lucky enough to see a few over the years, and they are wonderful animals. This reminds me of when I kept Mongolian gerbils, another species of rodent with long hind legs. When startled, they could literally move faster the eye could follow! Sometimes they appeared as streaks, but that was on a board offering relatively poor traction. On carpet, a certain female could vanish as if into thin air! Just there one moment, gone the next. To actually have that happen in front of your eyes is an experience which feels quite out of this world! :) All my such experiences with gerbils occurred at relatively close range, perhaps 2 feet from my eyes. I wonder if hares, being larger, might seem to vanish at longer range? Interesting observations and idea, and certainly not beyond the realms of possibility with hares.